A look at the future of Duke basketball. Future Duke phenom Austin Rivers and his Winter Park (Fl.) team faced off against the nationally ranked Milton (Ga.) Eagles in the Hoops in OverDrive Shootout. Milton boasts tons of Division 1 talent in their senior class: Dai-Jon Parker (committed to Vanderbilt), Julian Royal (Georgia Tech), and Shannon Scott (Ohio State). They also have 2012 wingman Evan Nolte, who is currently ranked #50 in his class by ESPNU, and Shaquille Johnson, who recently lost to Plumlee #3 in the City of Palms dunk contest. There has been some noise surrounding Duke recruiting Nolte, but only time will tell how his recruitment will play out. Milton won the game 75-60 in front of a packed house, beating Winter Park for the 2nd time in a week and a half. Simply put, Rivers got little support from his teammates, as he contributed over half his squad’s points (31 of 60). Rivers didn’t exactly have the start everyone might have been expecting in the first half. He only had 6 points and didn’t seem to get into an offensive groove—although he did have a nice block on Parker on a fast break. His team trailed 37-25 at the break. In the second half, however, Rivers came to life and showed why he deserves his high ranking. He scored 25 points in the final 2 quarters, raining threes from distance. He had several nice drives to the basket, where he would either finish himself with a variety of moves or pass out to a teammate. Unfortunately, the rest of Winter Park was stifled by Milton’s defense and failed to capitalize on Austin’s dishes. Conversely, Milton was ready to go on both ends of the floor. They were simply too athletic for Winter Park and dominated from start to finish. The Wildcats pulled close in the 2nd half due to Austin’s amazing play, but his effort was not enough to complete the comeback. Check out the highlights above (part of the ever-growing Austin Rivers mixtape collection), and you’ll see why we’re thrilled to have one more year to watch games in Cameron as Duke undergrads. The Duke basketball program has a lot to discuss with recruits. 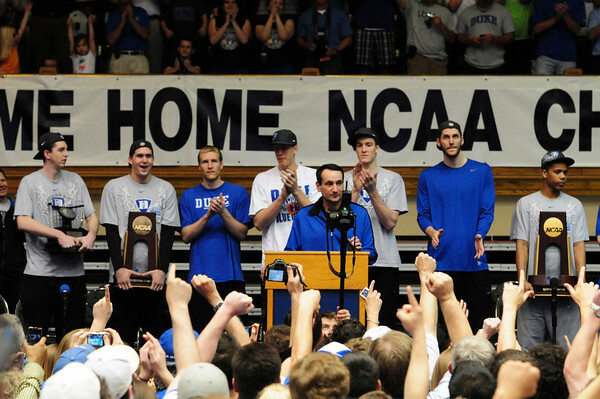 Duke has four national titles in the modern era of basketball, a legendary coach whose teams can’t stop winning championships, one of the best academic acumens in the world…and on, and on, and on. So the Blue Devil coaching staff has a lot of positives to throw out to recruits (and as Andy Katz reported recently, Wojo and Co. didn’t miss a beat while K and Collins were abroad). We have no reason to resort to negative recruiting, the underhanded and illegal tactics that are souring the world of high school sports and obliterating the “ethics” of coaching. That fact is not pompous, it’s not something that will necessarily last forever. For now, it’s just how things are. But let’s be real–not everyone has the benefits that Duke fans (and really, UNC fans as well) tote to the high ground. Look at Bruce Pearl. How could a man who hops around half naked at a Lady Vols game imitating the Truffle Shuffle also be a base hoops villain with no respect for fundamental rules? I know that the NCAA is a bass ackwards organization whose only saving grace is the Big Dance, but really, Bruce. I feel kind of sorry for you. That tan? Yikes. Being perpetually in the shadow of your football program? Tough life. It must be difficult for Pearl to have his recruits constantly dipping out on him and his players having frequent run-ins with the law. And after being banned from off campus recruiting for two years, things are just going to get worse and worse at Thompson Boiling Arena. Pat Summit has always worn the pants in this relationship and good lord, man, she always will. I’m thrilled to be a Duke student for the halcyon days that we have now firmly entered. Our recruiting, unlike Pearl’s, is going along swimmingly. Our targets, unlike John Calipari’s, did not play profe$$ionally in Europe or have their transcripts overhauled to be admitted to “school” (…reportedly). Our prized players, unlike poor Dana Altman’s at Oregon, aren’t jumping ship overseas (check those consecutive ocean metaphors!). Obviously, the Blue Devil program has had problems in the past. If I had a nickel for every time a rival fan (read: Kentucky) mentioned Corey Maggette and Myron Piggie, and literally snorted like a pig in imitation, I could buy season tickets next to Ashley Judd. And there is no guaranteeing that, in the post-Coach K era, Duke will always attract top talent to Durham or run a squeaky clean program. We can hope, but we can’t count on it. But for now, let’s enjoy the fruits of success. Coach K is stacking so much paper to the ceiling and slanging so many gold medals that Duke will probably have top 5 recruiting classes until he retires. The founders of this blog have at least two more years at Duke and in Cameron. With this roster, a coach who has his own holiday, and the Durham community, we’re hoping to ride the wave to Houston. Duke has offered 2011 standout point guard Quinn Cook, Jason Jordan on DIME Magazine reported yesterday. Thanks for taking our post-Felix advice, guys. Once Cook recovers from his knee injury, he’ll be an absolute star for Steve Smith at Oak Hill. 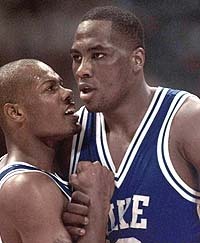 I hope (and kind of anticipate) that Quinn joins Duke and helps fill the hole left by his god-brother Nolan Smith. With Gbinije, Adams and Plum3 already committed (and Austin Rivers possibly on the way), we may be looking a recruiting class to sort of rival 1999. Maybe. Cook’s highlights from a solid summer are below. Thanks for all your support of Crazie-Talk, folks. Please leave your comments, thoughts and criticisms in the comments section. You can even tweet and Facebook this article if you want. I love the 21st century. The United States U-18 squad dominated Team Canada from the opening tip last night, winning handily 122-89. In one of the more hyped match-ups of a tournament, the Maple Leaf Nation had little to no chance. Especially with Duke 2011 top target Austin Rivers going crazy and scoring 35 points—a record for this competition. Rivers was uncanny, hitting his first nine three-point shots. His sixth trey broke the USA record—in the first half. It was a Ray Allen-like performance for Austin, while his father, Celtics coach Doc Rivers, watched from the San Antonio stands. Our 2010 commitments also played well; Irving netted 12 points and dished out seven assists. Kyrie got into the lane at will, distributing to USA’s capable forwards. Josh Hairston rebounded from a disappointing game against Argentina, posting 10 points and four rebounds. Josh did a good job of finishing around the basket, and knocked down both of his free throws. Quincy Miller cooled off after his big game against Argentina, but he had an admirable stat line of seven points, six rebounds and five assists. Miller shows tremendous poise in the open court; he handles the ball like a guard on fast breaks, slicing into the lane and getting by his defender with a variety of quick moves, including a vicious spin cycle that leaves him alone at the rim. Quincy is perhaps the biggest talent on this team, and we are really just seeing small flashes of what he is capable of (The hilariously incompetent commentator of these games referred to Quincy’s ’16 straight threes in practice the other day’ a dozen times in the past two nights). Amir Williams, who has been at the end of the bench for Team USA, is still getting into the flow of the game. Williams shows promise—finishing off one nice assist for a two-handed slam against the Nucks—but his hands are ’07 Lance Thomas-esque and he seems a little lost out there. Nonetheless, playing for his country will be a great experience for him, and Williams will definitely improve with time. He has gotten a lot of looks recently, and we’re sure that K and Co. will keep tabs on Amir—perhaps fellow Detroit Country Day veteran Shane Battier can give him a few pointers. Wednesday night at 8 p.m. EST, Team USA is back in action against Brazil, who pulled away late from Argentina to secure a spot in the title game. We hope that you join us for our final live-blog of this tournament—it has been a lot of fun talking basketball with a big cast of Duke fans for the past two games. Again, you can check out the live feed of the game here. Howdy folks! If you’re bored or obsessed with basketball like we are, make sure you tune into our live blog of Team USA’s matchup against Argentina in the FIBA Americas U18 Championships in San Antonio this evening. Team USA’s roster is stacked (as usual), and features five Duke commits and targets in the starting lineup – Kyrie Irving, Josh Hairston, Quincy Miller, Austin Rivers, and Amir Williams. You can take in a live feed of the game here. That said, the commentary is pretty terrible, so we’d love it if you stopped by to chat with us. The game is scheduled to start at 8:00pm EST (7:00pm CT).